Tattoo is the motif or pattern drawn on human body with body-compatible dyes using surgical steel devices produced for tattoo. Tattoo may sometimes be a letter, a name or a symbol. Tattoo is done for expressing feelings, for garnishing the body and for masking wound scar, stria or spots. Sometimes tattoo may be wanted to remove although it was drawn with great desire and attention. Q-Switch laser is used for tattoo removal in our clinic. This laser type is the most successful for tattoo removal. Laser rays with different wave lengths may be required depending on the type of tattoo. The dye used for tattoo is degraded when a proper wave length of laser light is used. This dye is carried by the cells and removed from the body. Old tattoos can be treated in a shorter time compared to new tattoos. How is tattoo removed with Q-switch laser? Q-switch laser is the most commonly used and the most proper method used for tattoo removal. Laser is effective in all tattoo types (amateur, professional) and all tattoo colors. Moreover there is not infection risk, spot risk or scar risk as the procedure does not cause injury. The system does not harm the other tissues. The procedure takes a few minutes, collagen is also triggered and thereby skin takes a younger, smooth and clear appearance. How is tattoo removed with Q-switch laser ? Laser ray passes epidermis and absorbed by the compounds which are located in dermis and subcutaneous tissue, and gives the color to skin, these substances are degraded and eliminated by immune system. Q-switched Nd YAG laser is the technology which is effective in the largest color spectrum for tattoo removal. While the dark color tattoos can be removed easier, light color tattoos can be removed more difficultly. Usually tattoos are colorful. Various colors are obtained by adding iron, carbon, mercury, cadmium, cobalt, chrom and titanium to subcutanrous tissue. Black tattoos can be removed easiest as that may absorb every light. Dark colors are also easy to remove however colors like yellow, green may be treated more difficultly and in a longer time. Recovery is fast if the tattoo is in a well supplied region like face. While this enables to work with a higher energy, response may be obtained in a shorter time and easier. However regions like trunk, arm, leg may require more sessions. Although anesthesia is usually not required for tattoo removal, local anesthesia may be useful in sensitive individuals. How long does tattoo removal with Q-Switch laser take? It requires 1-8 sessions depending on the location, depth and color content of the tattoo. Does tattoo removal with Q-Switch laser require anesthesia? Although anesthesia is usually not required for tattoo removal, local anesthesia may be useful in sensitive individuals. What should be done after tattoo removal with Q-switch laser? Epithelizing creams should be used after tattoo removal with laser. Sun protectors are useful between sessions.. Removal of unwanted tattoos is a problem that requires solution for long years. Many methods are applied and tried for this purpose. Q-switch Nd YAG laser is the most effective and safe method. We are using 2014 model of 1.4 J Q-switch Nd YAG laser in our clinic. This laser system enables to yield successful outcomes without leading to scar tissue through its high power and velocity. Applications are performed by our doctor and determined according to the type, depth, pigment colors of the tattoo. We perform the procedure with the highest power that does not harm your skin. We administer local anesthesia and cold air for reducing pain and improving comfort. Number of sessions varies depending on the color and depth of tattoo pigments. Usually the patient is satisfied at the end of the 5th session. While more sessions are required for colorful tattoos, satisfactory outcomes may be yielded with less number of sessions in dark black and green tattoos. Q-switch laser system is effective in every color of tattoos, large tattoos may even be removed in a short time like 10 min through its high velocity. 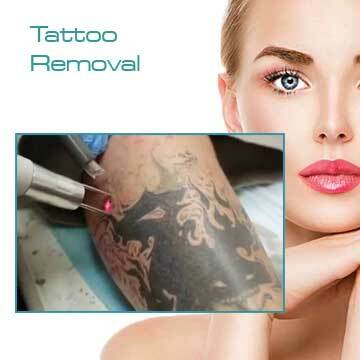 What is the charge for tattoo removal with laser? The charge varies depending on the size and type of the tattoo. Price is reduced as the size of the tattoo is reduced. To which regions can tattoo removal with laser be applied? It may be applied to any body part. Can every tattoo be removed with laser? Dark and professional tattoos are the easiest ones to remove. Other colors may have the risk for leaving scar although it is light. What should be done after tattoo removal with laser? The region that application was done should be protected from sun. An epithelizing cream is sufficient to use during the week after the procedure. The application site should be kept clean and water should be avoided at the day of application. Shower can be taken on the following day. The patient may continue his/her daily activities. While it takes about 5 min for a small tattoo, it may take one hour for large tattoo or more than one tattoo.